The ERJ140 is a twin-engine regional jet, compact and efficient, designed for shorter flight routes. American Airlines uses the ERJ140 for many of their regional routes. This 44-seat passenger airplane can take you anywhere you need to go within a 3-hour range, and the ride is as smooth as bourbon from the Bluegrass State. But the cabin is only 6 feet in height. I’m 6’-4”. I think this is the perfect place for me to begin my story about my travels to Cincinnati, Ohio. So, I crammed myself into the compact jet feeling oafish as I made my way to my seat, only to find that my carry-on was too big to fit overhead. The stewardess was great, very accommodating. I’m sure she has experience dealing with big oafs with big bags. She smiled, and then took my bag and placed it into the closet up front. I sat in 3B, an aisle seat. No sooner than I sat down, the patrons for seats 3A and 3C arrived. Really, I could hear them before I could see them, two British-sounding women on the jet bridge arguing with a worker about having to leave their suitcases on the bridge to be placed in the baggage area. They were only flying in to Cincy to connect to another flight going to Chicago. The Chicago flight was leaving at virtually the same time as our plane was scheduled to land. They did not want to miss that flight. They made that clear, and then stomped into the cabin to take their seats. In this particular plane, the A seats are on one side of the plane, and the B and C seats are on the other, the aisle separating the A seats from the B seats. Being in 3B and realizing that they were due to sit on either side of me, I quickly came up with a plan that would work for them and for me as well. Everyone was seated and buckled in. The lovely stewardess did her mime routine to the recording about the oxygen masks and exit routes, and just like that we were off. Here is the part where I could complain about my two British neighbors passing cookies and conversation across me, proving undeniably why my idea to switch seats made sense. But I won’t complain about all of the infringement of personal space, because the truth is that 20 minutes into the flight I fell asleep, and I had one of those wicked plane ride naps where your head flops to-and-fro and you snore so loudly that it wakes you up two or three times. My calling the hogs had to have made it difficult for them to talk across me. In the “annoying passenger category,” I would score our combined experiences a wash. I awoke just in time to see our jet gliding effortlessly over the rolling bluegrass hills of Kentucky. When you fly into Cincinnati, the airport is in Hebron, Kentucky. This part of America, as seen from the skies, is right out of a Bob Ross Joy of Painting episode. Pillowy clouds throwing shade over acres of hunter green fields, rivers etching themselves across the land, drawing themselves between the hills to form valleys; if art reflects reality then there could be no better muse for landscape painting than to see the Greater Cincinnati Area from the sky. We landed as gently as a jet can land, I bid my seating adversaries safe travels, and I began my journey. In the Cincinnati/Northern Kentucky Airport, there are small museum exhibits in various places throughout that are tagged with signs that say Curate My Community. The phrase caught my attention. It speaks to ownership and accountability. First impressions are everything, and the exhibits with these signs impressed me and set the standard for the lens through which I would look at Cincinnati. of Mortar entrepreneur training program. New Yorkers think they invented America. Everything, we look at from a New York eye. So, when he told me that this version of our Brooklyn Bridge came first, I had to find out the truth. The truth is, my driver was correct. The John A. Roebling Suspension Bridge was opened for use in December 1866, 17 years before the Brooklyn Bridge was completed. The designer for both bridges was John A. Roebling. 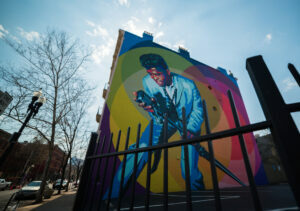 It was the beauty of the finished product in Cincinnati that inspired him to replicate it on a larger scale in New York. Although he designed the Brooklyn Bridge, he never got to see our bridge completed. He died in 1869 due to complications from an accident that happened while he was fixing the location for the Brooklyn Bridge at Fulton Ferry. 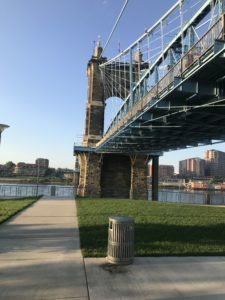 Seeing both bridges, it is undeniable that Roebling’s work in Cincinnati is the catalyst for one of New York’s most famous landmarks. The bridges aren’t the only things that New York and Cincinnati have in common. The Carew Tower is a 49-story art deco building in the heart of Downtown Cincinnati, and if a New Yorker should find his way into the lobby of this tower they would surely be aghast at the fact that the Carew Tower completely mirrors the Empire State Building. The Carew Tower was the model used to design the Empire State Building, from the outer structure all the way down to the decor and moulding. So, yes, Cincinnati gets a point for architectural swagger. One of the first things that you notice as you make your way through Cincinnati is the wonderful murals that adorn the communities. In total, there are 147 public murals in Cincinnati, most of them beautiful enough to stop you still, just so you can take your time to give it the proper attention. 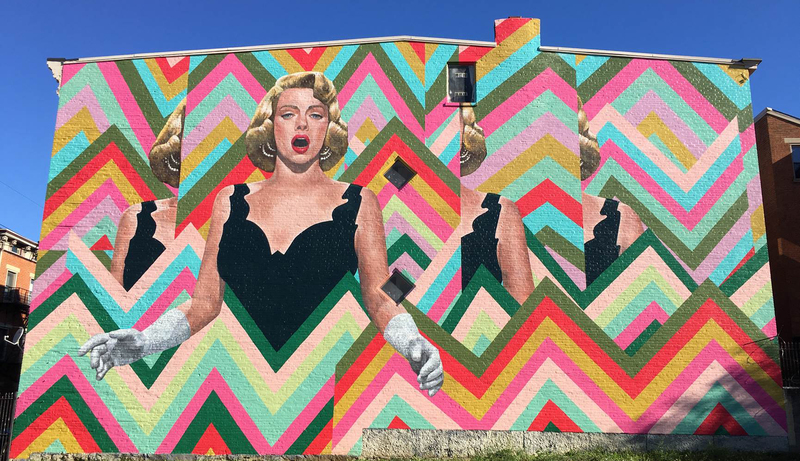 Rosemary Clooney, Ezzard Charles and James Brown are just a few American icons emblazoned along the side of various buildings and homes. Clooney and Charles are homegrown talents, while Brown’s significance to Cincinnati is that his career was launched by Federal Records, which was owned by Cincy’s iconic King Records. Each and every mural tells a story about Cincinnati. The last passenger pigeon in America died at the Cincinnati Zoo. Her name was Martha. She has a mural. The “flying pig” is an old Cincinnati term. Eras ago, Cincinnati was known for its pork market. When pigs were being led to slaughter, if one happened to break free and take off, the pig farmers would yell “flying pig!” The flying pig is depicted in a mural. Every mural gives you a lesson into the history of the city, and what makes this even more fascinating is that most of these murals are painted by high school and college kids. Artworks is an award-winning nonprofit that hires and trains local youth to be impactful in their communities using art. This organization has literally transformed this city with its work, and in the process, it has empowered local youth while giving them the buy-in they need to maintain accountability in their community. If I have a hand in creating something when I’m young, I’m more likely to continue to care for it as I get older. You remember the signs in the airport that I mentioned? Curate My Community? Yeah, that’s certainly happening in Cincinnati. They get a point for cultural impact, and an extra point for creativity. Any city you visit, the truest determination of its climate and temperament can be found in the words and actions of its people. Coretta Scott King once said that “The greatness of a community is most accurately measured by the compassionate actions of its members.” I mean, bridges and buildings are nice, art is cool, but none of it matters if the people are in turmoil. Every aforementioned point would fall moot if the common man and woman of Cincinnati weren’t in accord. I remember hearing about Cincinnati in 2001 when the death of Timothy Thomas sparked riots in the Over the Rhine neighborhood. So, I wanted to talk to the people. I wanted to shake their hands, look them in the eye and learn about the city from their words and actions. I met guys like William Thomas and Derrick Braziel. 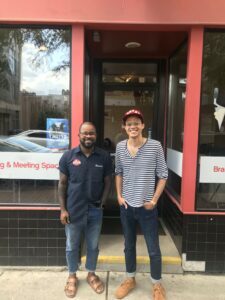 William and Derrick are the co-founders of a company called Mortar. Mortar works in the Over the Rhine community training local men and women to become business entrepreneurs. 175 members of the community have graduated from the Mortar Program. 90% of those are African-American, 70% of those are women. The goal is to change lives through entrepreneurship, knowing that people take pride in ownership. Pride breeds involvement and that turns people into doers. Curate My Community. I was beginning to realize that this was more than a slogan, this is the soul of Cincinnati. Mortar and the businesses that it has produced are part of the reason why the Over the Rhine community, a community that was destroyed in the 2001 riots and was one of the poorest communities in Cincinnati as recent as six years ago, is now one of its most progressive and promising. When you talk to William and Derrick, or Susan Lomax who heads Source Cincinnati, or Darren Redus, Sr., who is the Executive Director of the Minority Business Accelerator, what you hear in their words and what you see in their eyes is a deep and loving pride for their city. You hear camaraderie. You hear faith. You hear inspiration. The people of Cincinnati have taken it upon themselves to define their city. Somewhere along the way, they decided that working together to solve community problems makes more sense than trying to go it alone. So,they tossed aside race and political divisions and they worked at it, one community at a time until the entire city began to change. I don’t think I’ve ever been to a city where people were rooting for each other as much as the people that I met in Cincinnati were. If Coretta King’s words are to be adhered to, then Cincinnati is indeed a great community, measured by the compassion of its members. Give them a point for the people. In fact, give them two. Next week, I will discuss cuisine and the Cincinnati Music Festival. I will explain what a 5-way with a Coney Cheese chaser is, I will let you know how Goetta tastes and I will tell you about one of the longest-running music festivals in the nation.